The idea for our documentary  was really quite simple. 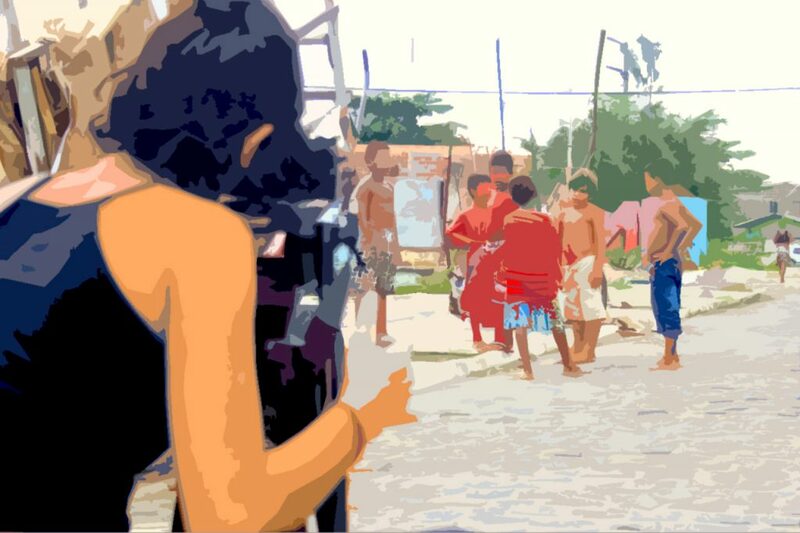 Children from a favela would make a short fictional film in which they showed how they imagined rich kids lived, while a group of children living in an upper-middle-class condominium made one about how they imagined life in the favela. We showed each film to the other group, and then brought the children together, first in the favela and then in the apartment building. To understand this story, we have to begin from when these privileges became rooted. 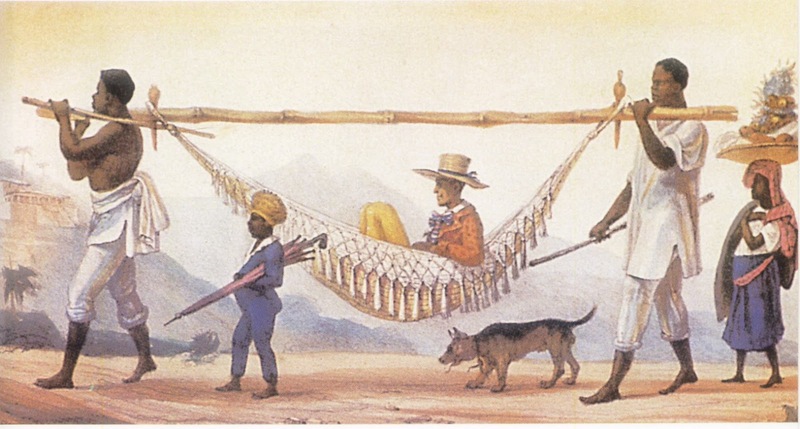 The Portuguese colonial power enslaved the ancestors of the children who now live in the favela and brought them across the Atlantic to work in the huge sugar plantations in what is now the state of Pernambuco. Slavery manifested itself in Brazil’s northeast in a particularly brutal form. Portugal was a small and underpopulated kingdom trying to control a huge realm: it could never develop the administrative controls of the French, British, or even Spanish empires. Freyre explored a new form of colonial administration and inheritance based on competition between the master’s legitimate and illegitimate children: with so many possible heirs, the master could base his decisions on obedience and who was best able to support his tantrums and authoritarianism. ‘That morbid delight at being evil with subordinates and with animals: it is so much ours, the inheritance of any Brazilian boy touched by the slaving system’, Freyre wrote, recognising the sin even in himself. He went on to cite Bras Cubas, the great novel by Machado de Assis, where the narrator says that when he did something bad – torment the slaves for no good reason, play tricks on a visiting old woman – ‘my father would reprimand me in public as a pure formality, but when we were in private, he would kiss and congratulate me’. Geography serves as a broad means to understand this social distance: in colonial Brazil, the slaves inhabited the senzala, strictly cordoned off from the Casa Grande where the master and his family lived. Only a small cohort of trusted slaves would be allowed to serve in the Casa Grande and cross the border between the two worlds. As economic changes moved the descendants of slaves into the cities’ favelas, the relationship between condominiums and favelas came to mirror the old distinction between Casa Grande and senzala. However, in a country where mixed-race people were able to obtain power through the new state bureaucracy and nascent industry (in which the old elites were largely uninterested), new definitions of power began to emerge. According to Jessé Souza, even the definition of race changed: ‘to be white was to be useful to the Europeanisation of the country’. Newly powerful families expressed their status through access to and the show of European commodities. Fashion became a basic tool of class formation: wearing clothes from London or Paris, drinking beer from Germany, and using the latest carriages and landaus became ways that the elite could show their superiority, regardless of their racial background. Black and white, favelado and elite are easy words, but being ‘moreno’ is based not only of having African or indigenous ancestors, but also of the amount of time spent working (and playing) in the sun. Years ago, one of our young friends from the favela spent two months in Europe on an exchange programme, and we and his mother waited for him at the airport. When he stepped out of the baggage area, his mother did not recognise him for several seconds. ‘I always thought we were black’, she laughed with us later, ‘but then I just realised that we’re always sunburnt’. A common Brazilian phrase illustrates this complex social construction of race: ‘Branco quase preto de tão pobre’ – white, but so poor they’re basically black. Even the architecture of modern Brazilian apartment buildings embodies this: a ‘social elevator’ leaves from the lobby to each front door, while a ‘service elevator’ will leave from the back of the building – often where the bins are kept – and go to a ‘service area’ in the home, the laundry and kitchen. 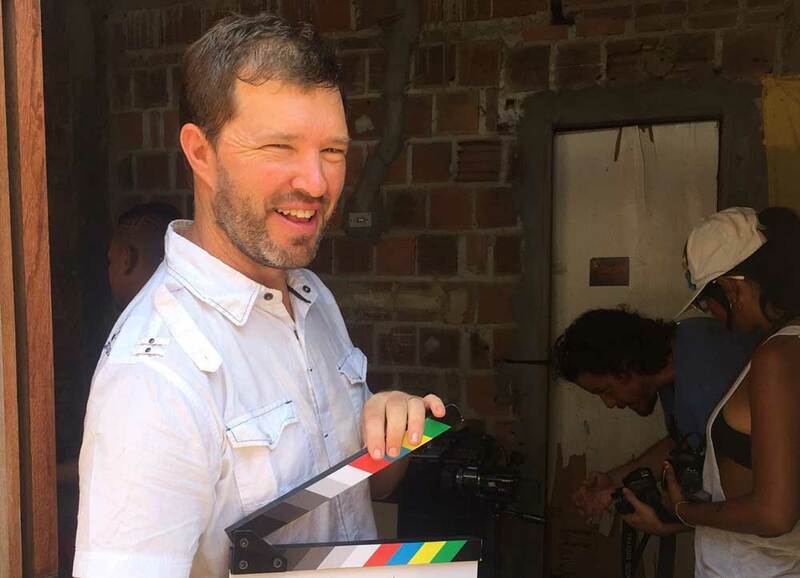 As we filmed the documentary in the middle-class neighbourhood, at one point the camera assistant, a young man from the favela, found himself alone in the ‘social elevator’ with a resident of the building, who accused him of being a thief and demanded explanations from the film staff. We were furious, but the young man took the affront as a completely normal, everyday humiliation. Recent architecture shows an even more glaring example of this segregation: in addition to separate elevators, some apartments now have separate kitchens, one for the day-to-day cooking done by the service staff, and another ‘social’ kitchen where the owners can cook to show off for their friends. Without race itself as a legitimate way to build social hierarchy, walls must be built of callouses, posture, vocabulary, and sunburn. This brief historical survey helps us to understand the fundamental role of public universities in the 2016 coup. In the 1990s, an outsider might have seen Brazilian higher education as almost utopian: public universities were free, some were of excellent quality, and they offered a diverse menu of majors as pathways to the managerial and bureaucratic elite. A closer look at the student body, however, showed that almost all had attended private schools and came from the upper-middle class. In fact, the public university had become a lavish federal subsidy for the elite to reproduce itself. Many observers believe that this policy served as one of the proxy causes of the 2016 coup d’état: with poor, black, and indigenous students gaining access to public universities and the civil service, the traditional upper-middle class realised that the superiority previously conferred by the state was under threat. As in the mid-nineteenth century, social mobility through the universities and business enterprises challenged fixed definitions of race and social status. 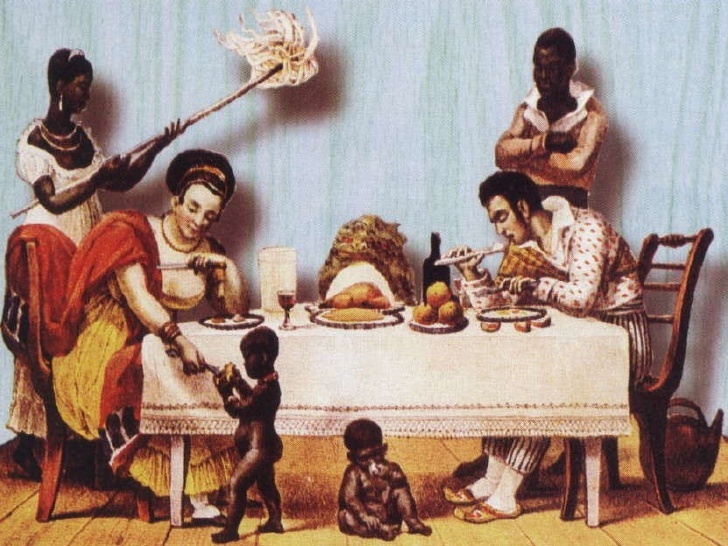 Radical members of the elite needed to repeat these forms of lynching to defend the walls of privilege because of the peculiar fluidity of race in Brazil: to repeat Souza’s perceptive comment, being white isn’t really about race, but about a person’s role in making the country seem more European. As she spoke, we could see that she sees humiliation and money as part of a vicious feedback cycle: ‘We learned in school about gender and salary, and it turns out that women do the same job as men and get paid less. For the same work. 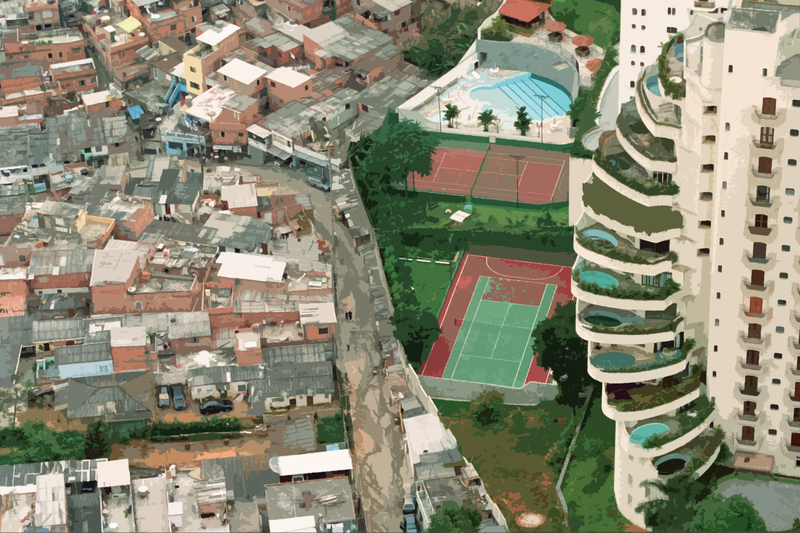 In the same way, someone from the favela is paid a salary, but is it the same as rich people earn for the same work?’ Simply because people are from the favela, they will be paid less. Being paid less, they will be humiliated and have to live in the favela, and their children won’t have shoes to go to school. Again, children see control over fashion as a way to calcify or fix social status. 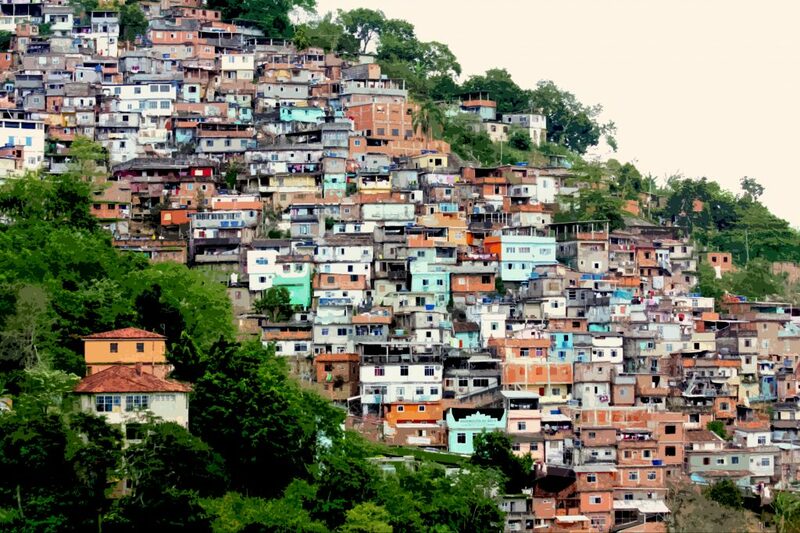 The question is not only the distribution of concrete benefits – which the state provides disproportionately to rich neighbourhoods – but also of recognition: as Letícia put it, the areas that tourists and rich people will visit. Brazilians have a pithy saying for the theatre of the symbolic: ‘Para inglês ver’ (For an Englishman to see). What, then, is the dream of the Brazilian New Right? Its actions show two clear goals: first, to regain the impunity, authority, and other privileges of the rural feudal lords of the Casa Grande; and second, to recapture the honour and respect that they felt they had begun to lose in the 15 years of Workers’ Party government. The ‘re’ in these goals explains the ‘new’ in the New Right: their goal is the re-conquest – and not simply the defence – of lost privileges. A boy’s candid desire for freedom to play can become poisoned by what Nietzsche called ressentiment, the bitterness of feeling that others enjoy what we cannot. For Nietzsche, ressentiment corrupts desire: rather than sweating and striving for what we want, we long to prevent others from having it. To this point, we have referred to the ‘the elite’ largely as a way to refer not to any individual person or group, but rather to the collective interests of groups that have for centuries controlled Brazilian politics and economics. We now need to be more specific, because there is a difference between class interests, conscious beliefs, and what individual people and collectives actually do. We discuss of the vanguard of Brazilian fascism: young men who believe that they serve as the shock troops to defend good morals, capitalism, and the traditional family. These are the inheritors of the fashion-lynching gangs of the mid-1800s, seeing themselves fighting the dangerous new fluidity in power and money. This is not to suggest that most middle-class, conservative, or even elite Brazilians agree with these perspectives, merely that their interests benefit from the actions of this small, vocal, and violent minority. Similarly, in the 1920s, it would have been unjust to tar conservative and business-minded Germans as the allies of the Freicorps; nonetheless, as the decade rolled on, the conservative establishment first became the beneficiaries of Freicorps’ action and then their allies in Nazism. Journalists  who have investigated the Brazilian equivalent of the alt-right (as elsewhere, a variegated collection of true believers, social misfits, trolls, and angry (young) men) identify certain important beliefs and attitudes. We see another important parallel between the Brazilian alt-right and the new fascism in the United States, as seen in Charlottesville, for example, and among the most virulent supporters of Donald Trump: since they see themselves both as victims of a new world and as protecting civilisation against the filth of the poor, they have the right – the freedom – to realise their violent fantasies. Perhaps most importantly, there are very close links between these alt-right youth and the militias who control the drug trafficking and black markets in many favelas. They also revel in the right of the police to use violence with impunity: we see this on a daily basis in our work in the favela, but also felt it shortly after the coup in the pounding hooves of mounted police that tried to run us and our six-year-old daughter down during a peaceful street protest. Most middle-class Brazilians would flinch from the language used by militias and the alt-right –rants for enforced sterilisation of Muslims, immigrants, and the poor; accolades for torturers from the military dictatorship; peons to fascism. At the same time the militias and alt-right have become both very effective guards of tradition and an expression of the social unconscious and its ressentiment of the supposed freedom of the favela. For real hints of hope in resisting Brazil’s new authoritarianism, we must look at a much broader portrait of contemporary social movements. Sadly, developments over the last 30 years have weakened the traditional pillars of the Brazilian progressive Left: the globalised economy has undermined trade unionism, the Vatican and neo-Pentecostal groups have all but destroyed Liberation Theology, and powerful financial interests have invested in transforming higher education into mere job training. Afro-Brazilian history, culture, and religion have long served as a resource for the Brazilian Left, from the syncretism between candomblé and Liberation Theology to the use of drums, dance, and theatre in social movements. Over the last 20 years, a nexus of intolerant evangelicals, drug gangs, and politically connected militias has begun to repress Afro-Brazilian religion ever more openly; finally, in 2016 the right-wing evangelical Marcelo Crivella became the mayor of Rio de Janeiro and began to use state power to support this violence. In several cases, cabinet members have been exposed as running para-military death squads that force indigenous groups from their land and murder leaders who refuse to move; according to the Inter American Commission on Human Rights, more than 700 indigenous and environmental leaders have been killed in Brazil over the last 15 years, and the numbers have increased since the coup d’état. 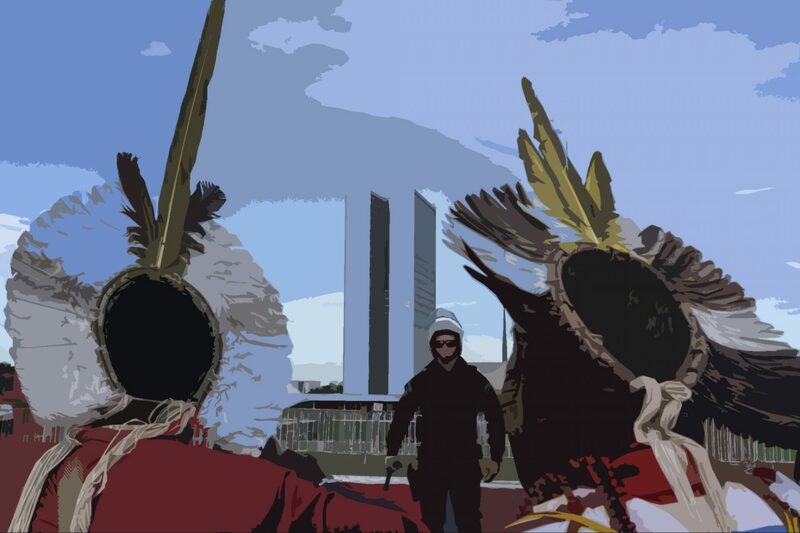 Indigenous activism continues to be an important part of resistance to authoritarianism in Brazil: not so much in pure numbers, but in the dramatic image of their feathers, bows, and blow-guns in front of the capitol in Brasília. At the time of writing in April 2018, this opposition to the coup has taken up a new banner: after ex-president Lula was given a prison sentence based on incomplete and often falsified evidence, he refused initially to be taken to jail. Close to 20,000 people surrounded him in the centre of São Bernardo do Campo before he eventually turned himself in. Finally, community media has become an important point of resistance to the New Right… and, perhaps more importantly, a way to undermine the social dynamics we have diagnosed in this essay as the causes and justifications of authoritarianism. In the context we have described, how do we learn about the ‘other’? Through ideologically biased media. The rich learn about the poor through the pornographic ‘true-crime’ shows that infest afternoon TV. Previously, young men felt that they could only gain recognition through violence: as one teenager put it, ‘when you put a gun to the head of a rich old woman, she knows you exist’. We suggested that even at a minor level, the internet makes it possible to develop new resources to build and maintain prestige. 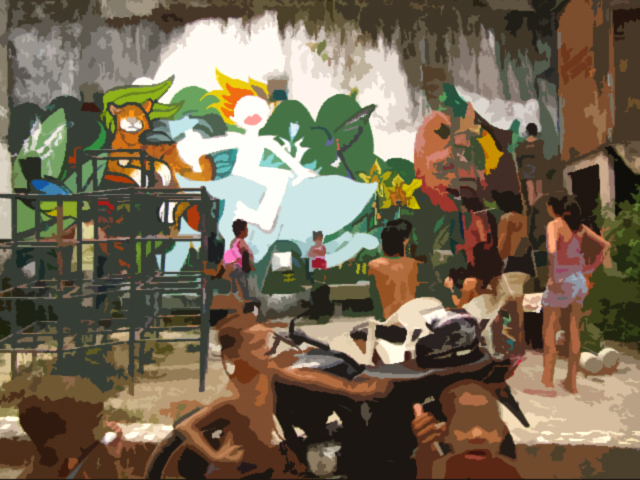 With three to five stories a week showing the simple and good things that happen in the favela – old men who sing in a bar, girls who teach other children to play marbles, skilled street vendors or performers – FavelaNews rewards different social actors and shows young people new ways to seek the previously scarce resource of recognition. To a large extent, the film we described in the beginning of this essay is an extension of these efforts: an attempt to use cinema and play as non-threatening ways to drill holes in impenetrable and well-guarded walls. In the same way that the gangs along the Canal do Arruda didn’t see an occasional break-dancer or soccer player from the other side as a threat, even the most fascistic defenders of the barrier between rich and poor have a soft spot for kids. The good-hearted parents who let their children participate in the documentary were excited that they could learn about the other side of the divide and that Brazilian public television – even under an authoritarian government – financed and will broadcast the experiment. 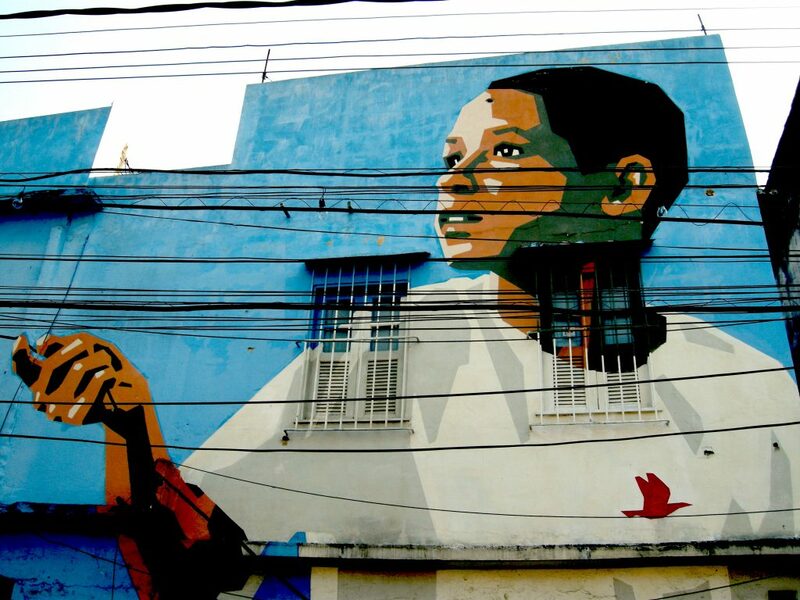 As kids from rich neighbourhoods play in the favela, they learn the complexities of the space: they can enjoy their right to play on the street (undermining ressentiment) at the same time as sympathising with poor black kids when police throw them up against a wall for a brutal daily frisking. Rita de Cácia Oenning da Silva was born in a peasant family that had lost its land in the south of Brazil, but she went to university on scholarship, worked as a professional actress for many years, and then went on to earn a doctorate in Anthropology. Kurt Shaw dropped out of a doctoral program at Harvard to found the largest network of grass-roots organizations working with street kids in Latin America. They produced the world’s first feature fictional film made by ex-child soldiers, made a telenovela by indigenous children that showed on Bolivian national TV, recorded an award winning hip- hop album where children from the favelas protest gang and police violence. They live in Florianópolis, in the south of Brazil, with their eight year old daughter, Helena. da Silva, Rita and Shaw, Kurt (directors). O Outro Lado do Outro. Recife: Usina da Imaginação and Ponte Produções for Brazilian Public TV, 2018. Souza, Jessé. 2017. O Elite do Atraso: da escravidão à Lava-Jato. Rio de Janeiro: Leya, p. 49. Freyre, Gilberto (1957). Casa Grande e Senzala. Lisboa: Livros do Brasil, p 354. Rio de Janeiro: Record, 1990. Theweleit, Klaus (1987). Male Fantasies, Vol. 1: Women, Floods, Bodies, History. Minneapolis, MN: University of Minnesota Press. da Silva and Shaw, K. 2011. Cartography of the Favela. Florianópolis and Santa Fe: Shine a Light.